I’m a huge fan of being counter-culture (I touched on this a bit in a past post here). I want to be who I am meant to be. Not what society says I should be. Not what others say or think I should be. Not trying to live up to the expectations of others. I used to be really insecure and my self-esteem was sooooo low. I remember when I was a teenager trying to decide what kind of ‘style’ I wanted to ‘be’. What for? Why not just wear what looks good on you, and what you like on yourself? Why not just do what you were made to do? Why not just be who you were made to be? Why not be an original, and not a copy of someone else? How about you? Do you try to live up to the expectations of others? Have you tried to be someone you’re not? If so, why? Are you comfortable and secure in who you are? Are you living that out? Love the picture and the sentiment! Yes, I struggled for many years trying to figure out who I was and how I should be. Simply because I was listening the world. It didn’t work, now trying to only listen to His voice and follow that. Not always easy but always worth it. Thanks for sharing Staci! Oh yes, listening to His voice. Me too. It’s so freeing, isn’t it? It’s crazy how strong societal pressures can be. I think it’s been a lot easier for me to not listen to society because of where I live now, and because of my lifestyle. It sure took a heck of a lot to recognize the lies though. Freeing is it exactly! The enemies voice comes in so many disguuses it is easy to be deceived so we must be dilegent in His power. God bless you Staci! Many blessings to you too Mark. Authenticity is something that has been lost in so many people. I too really struggled under a very critical step mother. It took leaving home to really get to know myself and break out of the “people pleasing” habit I had fallen into to keep the peace. Did you write the poem? It’s really lovely. Hi Wendy. Oh my. You had the stereotypical step mother eh. That’s rough. Yes, I did write the poem, and the art is mine too. Thank you so much Wendy for the kind words. First of all, I loved your poem. It was wonderful and speaks to individuality and non-conformity. I think that who I am changes from time to time, and is part of the process of life. I’d like to think that I’m a non-conformist, but I would have to allow for being influenced from the culture that I live it. However, I think that as we grow, and we start to question more and more, we can intellectualize those parts of us that are derived from cultural consensus. Thanks Rob. Have a great week. Yes, it’s like they had assigned expectations to her based on their world view. People ought to live and live more often. Have a great week, too, Staci! Thanks Rob. And that’s just exactly it. Their worldview which was built from sociological aspects I guess. Oh, I love it, Staci! I love the artwork and the words! If you continue with these, you could do a little book. The art is very unique!!! Awwww, thank you so much Sibella. You encourage me. Actually, I do want to do a book some day. A devotional actually. I want it to be like an art and devotion book with mixed media art, poetry and photography. Someday. Did you have to refresh your Reader for this post to show up? It only showed up in mine after refreshing. Ugh! WordPress is playing around too much I think. I’m so glad you ‘love’ this post. That makes me so happy. You’re so welcome! That is a great idea and I would want your book! Oh wow. Yes, you should publish an art and poetry book. And a cookbook too? Wow, that’s great. What kind of cookbook? Yea, another blogger friend of mine said that she didn’t see it in her Reader either. Real bummer, I’d say. Thanks a ton Sibella. Hugs right back at ya. My cookbook will actually be about baking, I think… 🙂 One day! Ohhhh, that’s great. Oh yes, that dreadful tyrant, ‘TIME’. Welcome to the club, my friend. I need so much more of it. 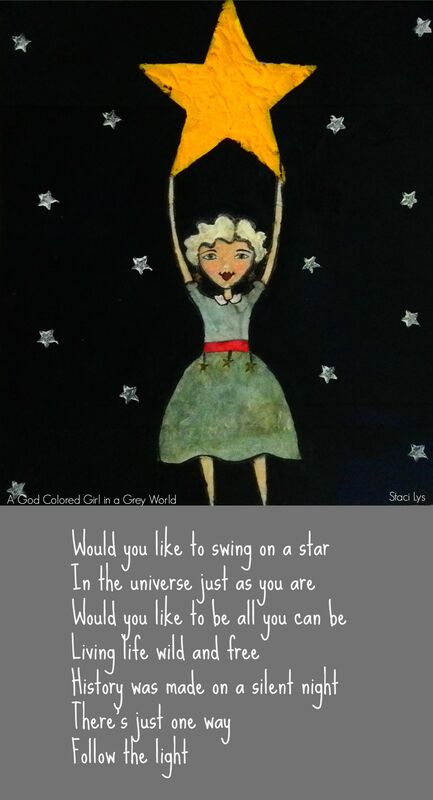 Staci, “Swing on a Star” is lovely, just lovely! Beautiful poem and amazing artwork! Do you think we have to grow into who we really are, in order to feel comfortable in our own skin? I think maybe it’s a process, and what we learn along the way is so valuable, just my thoughts. Great post, it inspires a lot of thought for sure! Please enjoy your week ahead, and take good care. –Totally. And I think it starts with the family and our upbringing. I had a rough upbringing and by the time I was an adult I was a wreck. Low self-esteem, unsure as to who I was and what I was going to do with my life. For this reason, the most important thing to me is that I raise my kids to be healthy and whole and secure in who they are. Who they are before God. Who they are within our family unity. Who they are as unique and beautiful individuals. I never had that. Too many people have never had that. And maybe that’s why we see so much depression now-a-day. Not saying that that’s the sole reason, but I believe it could be one of the reasons. Our culture and the society we grow up in also influences and shapes us. In writing and thinking about this ‘being yourself, and not necessarily abiding by what society expects of you’, I guess you could say that it’s a personal reflection. Like for example: I grew up in Canada, and as an atheist. I started questioning life, like those questions everyone has sooner or later. Why am I here? What’s my purpose? Where am I going when I die? Why am I frightened of death? I started searching and trying out all sorts of spiritual paths and all. When I became a Christian, it was like the beginning of breaking down a whole ton of lies that I had believed and all. Stuff about family. Stuff about myself, my identity, what makes me important, etc. In saying all this, my ‘growing’ into myself was a rough uphill climb. But, oh my goodness, the lessons learned have been extremely valuable, just as you said. Thanks again Pepperanne. I hope you’re having an amazing week and that the rest of it is great too. Staci, thank you for your lovely and gracious reply. This made me smile, and warmed my heart tremendously! “For this reason, the most important thing to me is that I raise my kids to be healthy and whole and secure in who they are. Who they are before God. Who they are within our family unity. Who they are as unique and beautiful individuals.” I believe that you are doing a terrific job of this! Awwwww, thank you so much Pepperanne. What a beautiful comment. I’m so glad this warmed your heart too. Have an amazing rest of the week, what’s left of it. Take care and warm wishes to you. Ohhhh Trini, you bless me with your sweet words. Thank you so much. I am so glad you ‘love’ the art. I am pleased with how it turned out. My daughter asked if she can have it. That was touching. I really do not know what to think about these difficulties with WordPress. I hope they fix these glitches soon. Awwww, thanks so much Himali. You always encourage me. Hugs and tons of love. 🙂 🙂 🙂 🙂 I’m smiling. You’re more than welcome sweetie. What grabbed my attention was this big golden star amidst the sky full of silver stars. It is so unqiue ! Ohhhhh, thanks sweetie. I was going to put the girl swinging by one hand and a side view. But then I thought about it some more and decided to do a full frontal. So glad you like it H.
Oh, this comment makes my day. I just wish I had another 24 hours in a day. Hehehe. Love the image so much! I used to try to fit in but thought that I am going to live in my body for as long as God allows so I should start feeling comfortable with it. I’m happy to be an introvert. 🙂 And we are blessed because we have Jesus and our worth and identity is on Him. Hahaha. Yes, this is true. I remember once when I was living in Hong Kong. I went into a store to try and find a pair of pants. The store worker showed me a pair and told me that they would be good for me because my legs are fat. Eek! I was already having a down day, and then she said that. It killed me. Maybe I was a little heavier back then, but I wasn’t fat. Could be the different body types. Yea, sometimes I’m comfortable with my body, sometimes not. I guess many women are like that. And yes, my identity is in Him. I was very insecure and self conscious when I was younger, Staci. Today, I’m much happier with myself and the choices I make and a lot less concerned with others think. That’s not to say I don’t consider my loved ones feelings, I never want to do anything that could hurt them. It’s been a long road but one well worth the bumps and detours. I love your poem and art…I want that too! Thanks for sharing you and your art with us! Oh yes, me too. I was extremely insecure and self-conscious. I was wreck throughout my 20s. I think that by the time one reaches 40, oftentimes we are a lot more comfortable in our own skin. Maybe it’s because we stop stressing the small stuff. We know what we value and are more secure in what we believe. Thank you so much for the kind words Geralyn. I’m so glad you enjoyed this piece. A simple piece, but I quite like it myself actually. My daughter is so cute. She’s only 5. After I finished, I showed it to her. She said to me, “Mommy, can it be mine?” Of course I said yes. I’ll have to frame it for her and put it in her room. Have a great rest of the week Geralyn. That’s so sweet. I bet your daughter will cherish her mommy’s gift. You have a great week, too, Staci! Ohhhhh, thank you so much Crystal. I’m so glad you like this piece. I think there are so many people, especially girls/women that can relate to this message. I struggled with it myself for years. –Oh really? I wish I was an artsy child. I mean, I had always sang, danced and acted, but the art, poetry and song writing only came up as an adult. I think people didn’t really understand me much either. Although, I was not a popular kid at all. I’m so glad you are embracing who you really are. Too many people define themselves by what they do, and not by who they are. We know who we are in Him, don’t we? I’m so thankful for that. It’s so liberating. Bless you, my friend, and have a wonderful rest of the week. I LOVE this mixed media art piece and your poem, Staci! You have such a gift my sister in Christ! You have been on my mind a lot lately. I’m praying for your creativity to be filled to overflowing – so watch out here it comes!!! 🙂 I’ve struggled with self-esteem issues all my life. I do much better now that I’m trying to see myself through God’s eyes, not the world’s. But I still sometimes struggle especially when it comes to my writing and photography. I have to remind myself not to compare my work to other people’s. That is getting better too…God is good like that! xoxo We need to Skype sometime soon so I can see your art room 🙂 I think we should call it Staci’s Art Cave! Awwwww, thanks so much Kirsten. You’re awesome. And such an amazing encourager. Just this morning I was like, “Ah God, I don’t have anything to give. What should I create? What should I write? I feel like I don’t have it in me. And then I was reminded of something that R brought up on Tuesday and that made me consider. My next piece I hope to post tomorrow. I already have the idea in my head for the art piece and the poem has the subject. Hahaha. Your prayers are working, my friend. I hear you about the self-esteem issues. I was a mess throughout the first 2/3rds of my life. I’m much better now. I think a lot of it is about where we find our identity. I think we also have to remind ourselves that there will always be someone that does something better than us, whether it be painting, writing, photography, whatever. Oh yes, definitely. Let’s do it. The Skype thing. I’ve noticed that your blog has taken on a new route. And yes, you still have to see my extremely messy and disorganized art cave. Hahahahaha. No joke. And yes, looooovvvveee the name – Staci’s Art Cave! Bless you, my friend. And let me know when’s good for you to Skype. I hope this doesn’t sound like dribble, but maybe it’s a good thing you “don’t have it in you” because then when you do create you know that it is all God! His creativity working through you to create the beautiful harmony of words and art. I understand exactly what you mean though about feeling creatively empty…so to speak. That comes over me in cycles. They don’t last long, but it does come. I am looking forward to your next post. And yes my blog has taken a new direction…sort of. I’m trying make it look more like a website for one. The other thing is that I’ve been out doing portrait photography a lot lately which means I don’t have time to blog. Taking pictures of people is much more time consuming than taking pictures of flowers. The flowers don’t seem to have any opinions on how they look! lol I’m actually enjoying the portrait stuff, but I want something grittier. Kind of like what I did with the “Working Hands” piece. Telling someone’s story through a picture of them or their hands. Please be praying that God would let me know what He wants to do with my photography because I’m not sure where to go with it. I want my work to glorify Him, but I’ve also always been called to have my creativity to speak to unbelievers as well. So I’m trying to figure out how to do that. If you check out my Facebook page you will see my last to photographs are part of my Scripture Inspired series. Hahaha. I’m totally not a morning person either. Although, sleeping in has been a thing of the past since my first was born. Oh my gosh. I don’t know where he got it from. Definitely not from me or the hubby. He is an early sleeper and he is up and ready for the day, as happy as can be, at around 6:00am. Or a bit later. He used to be up before that, although I’ve trained him to not require me getting up at that time too. lol. Stacilys, this is really beautiful and I love your painting. Did you draw it by hand or digitally? Thank you so much Indah. I’m so glad you like this one. I drew and painted it by hand. I think that our culture and society plays a large role in shaping us as individuals. However, not all of it is good. We need to be our unique selves and stay true to ourselves, regardless of what society expects. So glad you’re doing just that, my friend. Have a great rest of the week and weekend. hahaha. Yea, this is one that’s on the lighter side. thank you so much. I’m so glad you ‘love’ the drawing. Yea, it can be difficult because you don’t want it to sound like fluff, right. Many lighter ones can seem that way. Hahaha. I try to be myself and have done many things which have helped me grow, because i went against the heard mentality. I love this thought of yours. Blessings for you to keep on enjoying by being yourself! Awwww, thanks so much Alok. And blessings to you too. That’s great that you have been yourself and gone against the grain. Good for you. Awww, thanks Neha. You’re too kind. That’s awesome that you always try to be yourself and that you have such beautiful and accepting relationships. Can’t get better than that. I had lot of stress in searching thing called SUCCESS, like others, I doubted myself and felt lost. But then I quitted, I tried to find simple things that make me and people surround me happy like what im doing today. Ohhhh, thank you so much sweetie. I’m so happy you ‘love’ this. And that you are yourself and not what others expect you to be. I love that you seek out the simple things for happiness. And what you are doing today with your photography is absolutely spectacular. I love your photography and the simplistic messages your photos portray. Have a wonderful week sweetie. I meant every word, my friend. Ohhhh, thanks so much. I’m glad you like it. Oh yes, my teenage years were crazy. Oh my gosh, they were nuts. Am I ever glad that’s done and over with. Mine you, it was quite some time ago. Hehehe. I loved your illustration and inspirational words to go with i. I really liked the message you wnated to get across in this post. For sure it’s not easy to be yourself when all the people around you expect you to behave a certain way but it’s very empowering once you break the chains and go with the flow. I completely agree with you. It’s also a lot easier to be yourself when you’re secure in who you are as a person, and firm in what you believe. It’s sooooo nice to meet you. I’ll be over at your blog today to check out what goodness you’re up to. Really? Awwwww, thanks you so much. What a sweet thing to say. Ohhh, @I hope this passion of yours never fade! – You and me both Zee. I really hope my passion never fades. Sometimes when I get into a slump, I get a bit scared. Wondering if I’ll ever create anything of worth again. But then, I push through and it comes back. I am passionate about creating and all. I will be around for a long time still, my friend. As I’m sure and hope so much that you will be too. You need to keep us amazing with YOUR amazing talent. Here here to that, my friend. Lots of art and lots of creating.